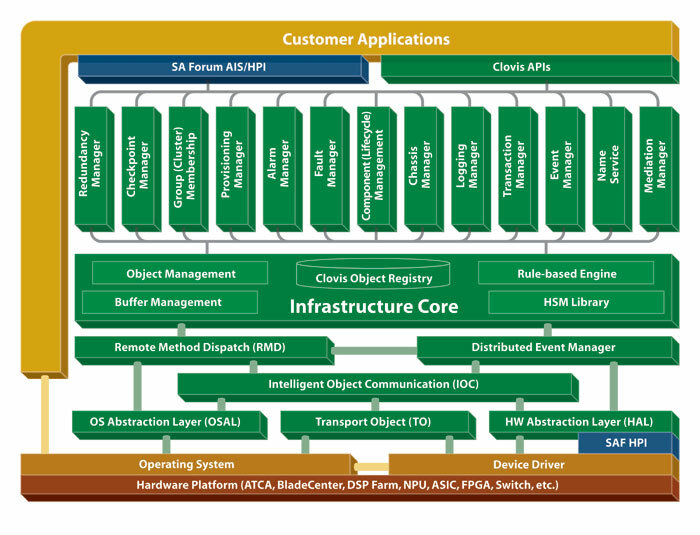 The OpenClovis SAFplus High Availability and Scalability Platform provides run-time services for your value added applications, offering a layered and hardware independent application environment. It implements the many services that are needed in your system to meet today’s high expectations of manageability and availability in carrier-class products. Efficient message passing across the physical and logical address spaces, with the latter can provide location transparency. Remote method dispatching, providing function-like calling semantics across processes and blades. Dynamic, distributed name service to register and bind names to addresses and services. Event distribution service following the publish-subscribe paradigm. High availability services are a key part of the OpenClovis platform. Our availability manager is the system’s central decision maker. It looks after your hardware and software components, and manages them at run-time – achieving the highest service availability as defined by your configuration. OpenClovis also includes the requisite infrastructure services needed to build redundant and resilient application software components. These services include check-pointing, group membership and location-independent addressing. Node management infrastructure is provided to store and maintain your managed objects. It allows access to the managed objects repository from the EMS/NMS via a range of network management protocol agents and it distributes the managed objects’ operations to your respective stake-holder application components. Application platform management services instrument the hardware platform, the OS and the middleware into the node management infrastructure. It provides a common, central managed objects-based view of the entire network element. In addition to the above basic infrastructure services a palette of infrastructure services are included, such as predictable memory and buffer management, logging, hierarchical state machine and debug infrastructure. Such services are must-have parts of any embedded system. To increase application portability, abstraction layers are provided for the operating system, hardware platform and optional database backend. The entire application service platform is built in a modular way, implemented as daemon processes and client API libraries. The platform has been pre-integrated and validated on a range of hardware and OS configurations. OpenClovis works with standards bodies and the open source community to deliver highly available standards-based solutions, so that our customers can deliver next-generation products and services in record time with significantly less risk and cost.